Found 2 file extension associations related to Commander Keen: Aliens Ate My Babysitter and 2 file formats developed specifically for use with Commander Keen: Aliens Ate My Babysitter. 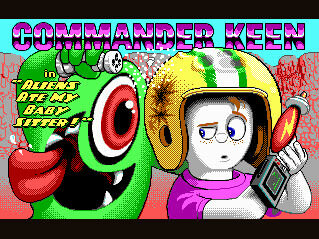 Commander Keen episode 6: Aliens Ate My Babysitter. A mean bunch of hungry aliens have your babysitter and they're planning to make her their main course. Now it's up to you, as Billy's alter ego Commander Keen, to climb into your homemade Megarocket and save her. Or risk explaining what happened to your parents. The only question is: Can you complete your mission before dinnertime? If you need more information please contact the developers of Commander Keen: Aliens Ate My Babysitter (id Software LLC), or check out their product website.